Many of you have followed up with that post by asking me about online dating. Well, here’s my advice and two-cents, which really isn’t much. After all, it’s only two cents worth so don’t sue me. If you have read my previous posts, you will know that I was a long time resident of Loserville. A ten year resident, to be exact and after a friend convinced me to try Match.com where I met the love of my life, I packed up my things and moved out of town for good. Trust me. If there’s FourSquare in Loserville, I’m pretty sure I’m still the Mayor. Use your brain. When deciding to find a date on line, safety is first and foremost. There are a lot of wackos out there but on the flip side, there are a lot of good people that are serious about wanting to meet someone. Use your common sense at all times. Most on-line sites won’t allow you to post contact information. You must go through their site to contact a person. Don’t give out ANY personal information until you are sure you are ready to talk in person. “How YOU doin?”– Introduce yourself . For me, I sent Dale a “wink”, which is Match.com’s way of saying “Hey you’re a cutie and I am interested.” So yes, since I sent Dale a wink first, I take full credit for this relationship. If they are interested, they will respond. Cyber stalk him. After we e-mailed each other back and forth I had enough information to Google him and had already checked out his Facebook page and his LinkedIn profile within the first few days. I saw pictures of his parents before I even knew their names. I found his ex-wife’s Facebook and Twitter pages. I found articles on awards that he had received on software he had written. My point is, do some simple research. Thank God Al Gore invented the internet so that we could do cyber-research on someone without them even knowing!! You might want to run a background check on them or even find their divorce information on line – it’s all public information. Now I didn’t do those things, but I’m pretty sure my Dad did. Talk to each other. We talked on the phone like silly teenagers – up until 2-3am talking about the most random stuff. You can learn a lot about someone just over the phone. Use your intuition – if something seems off then it just might be. (I didn’t give him my home number – just my cell number. I knew my home number could be traced to my home address, and I wasn’t ready to let anyone know where I lived. Don’t be a victim….meet in public. We decided to meet at a very public park, where it would be more difficult to kidnap me and make a skin suit out of me if that was his intention. Let someone know where you are going and give them a link to the page of the person you are meeting. Sounds a bit overcautious but just think about the skin suit and you won’t feel like you’re overreacting. Go the 20 questions route – talk about everything. We talked about everything from politics, religion, kids, reasons why we were divorced, reasons why we turned to on-line dating, what our parents do, etc. Meet his friends and let him meet yours. If he doesn’t have friends or “isn’t ready” for you to meet his friends within a few weeks of dating then watch out for that red flag…it’s going to be waving at you. Dale met six of my closest friends on our SECOND DATE. I was scheduled to do a triathlon with three of my girlfriends and we all met up for dinner to fill up on carbs. Poor Dale – he was answering questions right and left, but got the thumbs up from my girlfriends before dessert was even served. Trust me, you may be blind to any red flags, but your friends will openly tell you if your potential date is a raging psychopath. Talk about everything. Dale and I were really comfortable talking on the phone so when we met, the conversation transitioned very easily from introductions to life stories. Within the first hour of meeting in person, I knew about a near fatal car wreck he had when he was 17. There are going to be times when you can’t stay up until 2am on the phone. It doesn’t matter if it’s a long conversation or text messages, or emails, just get to know each other every single day. Meet each other’s kids, and let the kids meet each other. 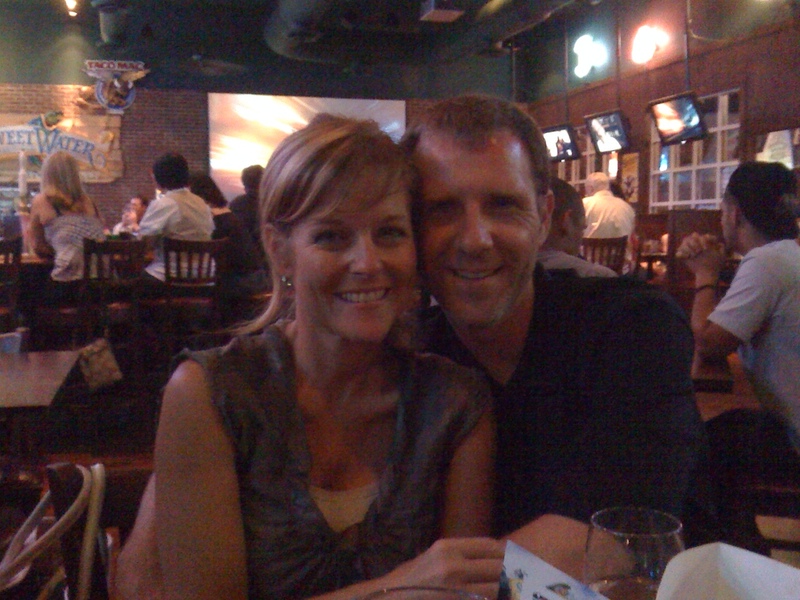 We were lucky that our kids were 15, 10 and 8 when they first met. The oldest worked at an ice-cream shop at the time so it was a perfect place to bring the younger kids. Make the kids comfortable when they are meeting potential step-siblings. Things are changing for them so you need to pay extra attention to their thoughts and feelings. Be realistic. You may meet the love of your life immediately or it may take a few tries. Don’t try to make something work if it doesn’t feel right and don’t rush it if you aren’t ready. Don’t settle! Finally, Have FUN! Dating isn’t brain surgery. It’s about meeting new people and seeing if there is a connection. Look at it this way – even if there isn’t chemistry, you got out of the house and did something out of your comfort zone…and you may have gotten a free dinner out of the deal! Score! This entry was posted in Dating, Uncategorized and tagged blind date, date, dating, dating advice, dinner, friends, funny, husband, in-laws, kids, loser, match.com, Mom, online dating, Pictures, public, wedding. Bookmark the permalink.